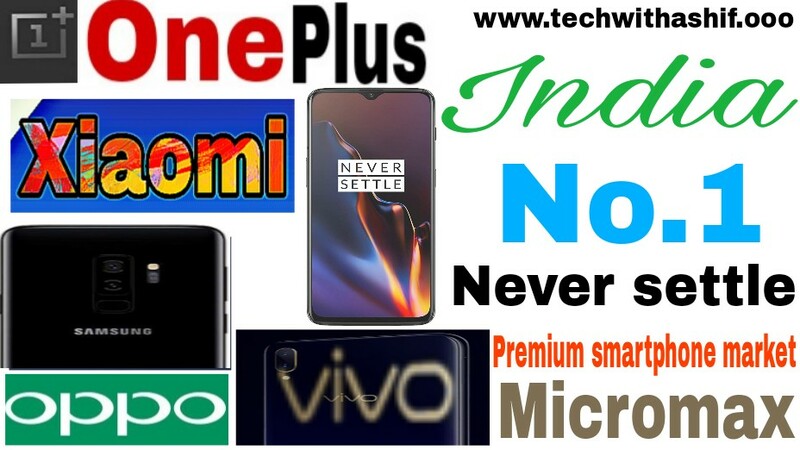 OnePlus became India's No. 1 company, defeating Apple and Samsung in the premium smartphone market. If you talk about the entire Indian smartphone market, it has seen an increase of 9.1 percent in a year. At the same time, Chinese smartphone maker Xiaomi sold the highest unit of 11.7 million smartphones, including the Redmi 5A and Redmi Note 5 Pro. OnePlus has surpassed Apple and Samsung in the premium smartphone segment market in India and has become India's No. 1 company. OnePlus, the premium segment has become the No. 1 company. This report has been disclosed on behalf of IDC, which includes phones above Rs 29,000. In the second quarter of 2018-19, OnePlus has shipped the mostunits. IDC India Associate Research Manager upasna joshi said that, Oneplus has gained this place due to its mobile phone, promotion and active on social media platforms. While the iPhone XS and the iPhone XS Max have failed to make their identities among the people. If you talk about the entire Indian smartphone market then it has seen an increase of 9.1 percent in a year. At the same time, Chinese smartphone maker Xiaomi sold the highest unit of 11.7 million smartphones, including the Redmi 5A and Redmi Note 5 Pro. Xiaomi, during this time, made its place in the premium smartphone segment, where the phone's name was poco phone. These phones give people premium smartphones at low cost. 1. Xiaomi - Xiaomi's market share has seen an increase of 27.3 percent, where its top models include Redmi 5A, and Note 5 Pro. Five million units have been sold in two quarters of both models. 2. Samsung - The company is in second place. The company is shocked by Xiaomi, Vivo and Oppo. That's why Samsung has brought its Infinity Series, which includes the Galaxy J6, Galaxy J2, J8, J4 and recently launched Android Go model Galaxy J2 Core. 3. Vivo - The market share of the company is 10.5 percent. Where two new phones have been launched recently including Vivo Y81 and Y83 Pro. Together with Flagship V11 and V11 Pro also. 4. Mimicromax - smartphone maker company managed to make the top 5 list. 5. Oppo - Because the company earned a little name due to Oppo F9 and F9 Pro, then there was also a reason for the company's own high end flagship device oppo find x. Friends, I hope you enjoy this information. You must share your thoughts in the comment box and subscribe to get the latest updates.